The growth of the electric and hybrid vehicle market and the need for a more sustainable way of powering vehicles have increased the demand for high performance and precision engineered electric motors and inverters that better integrate with battery and vehicle systems. Integral e-Drive are engineering the future today. Integral e-Drive are working on a new generation of advanced electric motor technologies that aims to significantly increase performance and at the same time reduce cost. This will impact the ease with which OEM’s integrate a new powertrain with existing and new vehicles and enable an accelerated migration to an all-electric platform where that provides a commercial advantage. Engineering the future is today’s focus for Integral e-Drive, delivering market leading systems to clients who are world leading technology companies themselves. Having made a name for itself in motorsport and automotive premium brands and continues to be Technology Partner to the triple record holding Volkswagen Motorsport I.D. R racecar, Milton Keynes-based Integral Powertrain’s e-Drive division [Integral e-Drive] will be returning to Cenex LCV 2018 (12-13 September 2018) to show the automotive sector what is achievable in high performance, high efficiency, and power dense electric motors and complimentary technology (e.g. Inverter). Engineering the future is today’s focus for Integral e-Drive, delivering market leading systems to clients who are world leading technology companies themselves. Visit the Integral e-Drive team on stand C3-503, Hall 3 where they will be showing a range of high performance, high efficiency and power dense e-Drives including a 3MW (4000HP) motor designed for the aerospace industry as well as the SuperGen range of 12-48V machines with integrated inverters, Control Units and a new innovative combined Inverter-Motor-Gearbox concept. A Jaguar F Pace Demonstrator vehicle will be on display in the steering pad for visitors to experience the efficient, robust and near-silent variable-speed compressor drive for high-pressure ratio continuous boosting delivered by a fully integrated SuperGen 48v hybrid-supercharger. 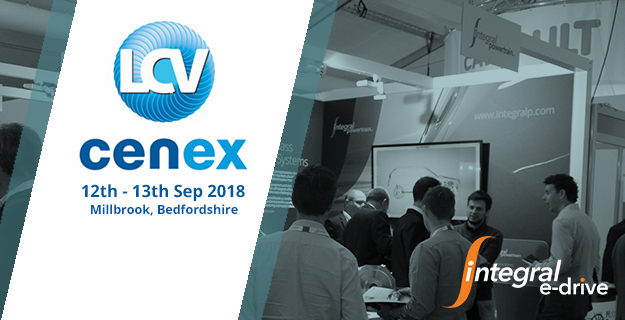 CENEX LCV is the UK’s premier low carbon vehicle technology show and networking event that attracted over 3866 visitors last year. The event boasts a lively seminar programme, ride & drive to experience the latest advances and extensive technology exhibition where you can get up close and personal with the technologies and some of the people responsible for them. Be the first to see Integral e-Drive updates leading to CENEX LCV 2018 by following our social media channels or contact us directly.